I’ve signed on for NaNoWriMo. If you’re a writer, you can’t avoid the chatter. Are you doing it? Are you doing PAD instead? 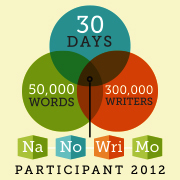 If you’re not a writer, NaNoWriMo sounds like a fruity cocktail or Latin-inspired dance craze. National Novel Writing Month. Write a 50,000 words novel in just 30 days. That’s a lot of words. I have a novel that I’ve been working on for a couple of years. I thought it was done, then realized it wasn’t. Thought it was done again, and still needed work. Lather, rinse, repeat, and repeat and repeat. I’m hoping this time is the charm, but I still have a ways to go. In the meantime, I have two stories that have been milling around in my brain itching to get out. Writing novels is like tapping into another universe that exists inside my head. The characters speak to me, and sometimes don’t speak to me, and I just watch and listen and try to keep up. I’m hoping that letting the characters in my first world rest might make them a little more eager to speak up come December. In the meantime, I’ll be building castles in a new sandbox. So, you may not hear from me as often, but I do like to write in my own voice sometimes, so I’ll still be here. Besides, the dude’s witticisms are too funny to keep to myself. Wish me luck, and if you’re doing NaNoWriMo, good luck to you too. This entry was posted in Essays, Poetry, Writing and tagged life, personal, Poetry, Writing. Good luck to you, Jeaninne! I look forward to hearing the dude! Today I am editing a memoir for a client. I love editing for someone else! I much prefer the writing to the editing. My prose seems so much lovelier the first time around. Upon the second reading it’s too wordy, and the third time through I’m wondering what I was thinking. Good luck Jeannine. I’ll be bugging you, I mean thinking of you thru November.